To optimise your website for search engines it's a good idea to add meta descriptions. In this guide, we show where you can do this in Website Builder. Tip: Learn what else you can do to improve your search ranking in our guide: What is SEO? 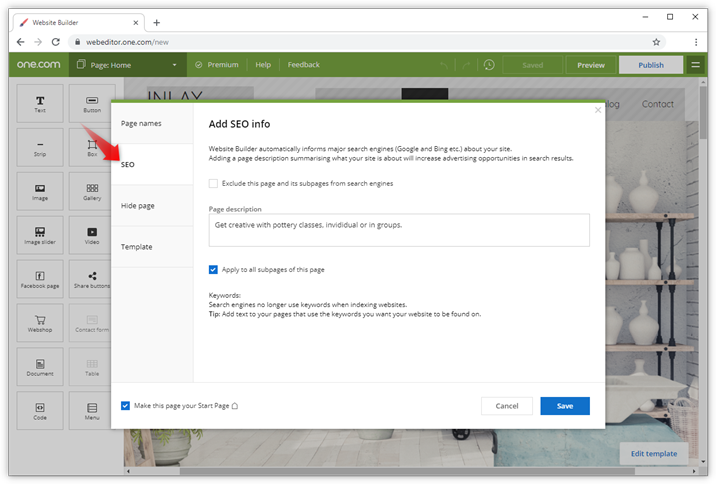 In the pages menu, move your mouse over the page for which you want to add the meta description and click Page options. Click SEO in the menu to the left. Enter a description of the page. A good meta description is concise and tells what the page is about. Check the box to apply to all subpages of this page, if you want to copy the description to those pages.